Le Toux isn’t a Union legend. He’s something more. I miss Sebastien Le Toux. I miss the runs. The goals. The perfect crosses. The engine that never quit. I miss the hustle. The work ethic. The way he loved not just Philadelphia, but Philadelphians, so much so that he even married one and essentially sacrificed his career path for it. I remember when he turned his back on a trial with an English Premier League side and left early because he wanted to come back home to Philadelphia Union. Yes, there was a player who actually did that. His name is Sebastien Le Toux. I remember the crime of Peter Nowak dealing him to Vancouver in 2012, for what true reason, none of us know. Probably to clear salary budget space for the guys he acquired on shady deals, skimming off the transfer fees, as Michael Orozco Fiscal revealed. Who knows? Better to forget it ever happened. Maybe we will one day. I remember when Le Toux came back. It was not just a classy move by then-Union manager John Hackworth. It was also a smart move. The Union got a steal. Because in his time with the Union, all Le Toux ever did was produce. Fifty MLS goals. 49 assists. Multiple positions. Critics like to rip on Le Toux for his imperfect touch, for his lack of superior dribbling skills, for the streaks. Le Toux was always streaky in front of goal, hot and cold. But when coaches deployed him right — and they seldom did, always trying to make him a right winger when he was really a striker — he was a monster. He scored. He passed. He passed. He scored. In his first four seasons with the Union, he netted double digits in goals or assists each year. If you played him on the wing, they were assists. If you played him at striker, where he belonged, it was goals and assists. He played five full seasons without earning a single booking, spanning 11,781 minutes. Not a single yellow card. A true sportsman. He wasn’t a glamorous player. In fact, he may have been the least glamorous French thing Philadelphia ever saw. But that’s why fans love him. He was a lunch bucket player. He wasn’t the fastest or the strongest, the most agile or the biggest. He was smart. And he hustled. He worked hard. And he never gave up. As they say in English soccer, he bled for the badge. If not, he bleeds for the fans, which is more important anyway. The badge hasn’t always deserved it. Maybe the badge will stop trading him one day. It was a time when professional soccer was newly returned in Philadelphia. Most didn’t remember the Philadelphia Atoms or other pro clubs that once called the city home. It was a blank slate. The team was awful that first year, but fans had Le Toux. When they made the playoffs in 2011, the only time they’ve ever had a winning season, it was Le Toux scoring those goals in that incredible hot streak down the stretch. Then Nowak destroyed the team. But we’ve been through that. The Union have never recovered from it, sad to say. The day Nowak sent Le Toux away was their original sin. Danny Califf, the only other true Union icon, soon followed, and the team fell apart. They haven’t recorded a season with a winning record since then. The team doesn’t sell out games these days. Nobody talks about expanding the stadium anymore. On June 23, the Union will induct Le Toux into a newly created Ring of Honor. It’s well-deserved. Credit to them. Maybe they’ll sell out that game. Maybe it will send a message that guys like Le Toux matter. Maybe not. Let’s not forget the Union traded him away again in 2016. Let the irony be lost on no one that the Union’s June 23 opponent is the Vancouver Whitecaps, the team Nowak dealt him to in 2012. I think he can still play. I think they should sign him for the season. He’d be a nice change of pace option at striker. That’s another story altogether. Le Toux announced his retirement today. Another casualty of the TAM increase. It’s all over. 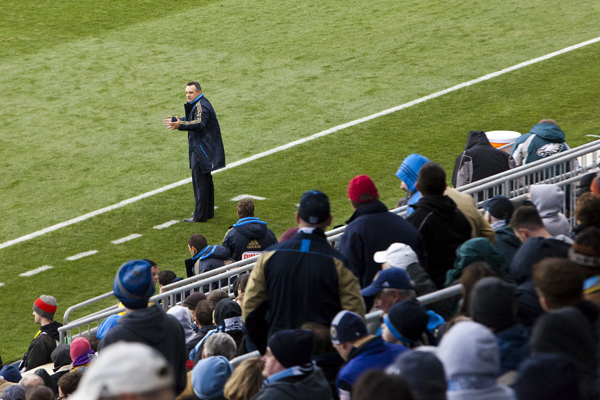 I rarely write about soccer from a fan perspective. But Le Toux and Califf, they’re something else. They require a different sort of appreciation, not cold analysis, but the warmth of friendship. They were the players who shaped the Union, who shaped the club’s early culture, who led the way in creating something that looked like it was going to be special. They broke down barriers between fans and players in a way you rarely see in professional sports. Sharing beers with fans, hanging out on the side, making the area their home, and then fighting like hell to get back to this place they loved, despite every ridiculous barrier thrown in their way. They were — are — authentic, honest, and earnest. They were everything that was — that could have been, that should have been, that hopefully could be again — right about Philadelphia Union. Maybe the Union will get that back someday. We should hope so. Alejandro Bedoya has some of that in him. So do some others. They just have to win too. In British soccer culture, they call great players “legends,” but Le Toux and Califf weren’t legends. They were something better. Dammit, The Truth! Don’t. Just … don’t. I gobbled down Jim’s “breaking news” piece yesterday with great gusto; but after re-reading it, I still felt a slight twinge of disappointment. Thank you for filling a void that I didn’t even know I had, Dan. All of this. Every bit of it. Sebastian Le Toux was unknown to me when I went to the Linc to see the Union play DC united in 2010. By the end of the game I had to ask who he was and how fast can I get my hands on a jersey with his name on it. I still have the jersey, plus three more with his name and the numbers 9 & 11 he wore for the Union. I am proud to have those memories and the feeling that Seba would save us, no matter what. I won’t be able to attend the game but will wear his jersey that day with an overwhelming sense of pride and joy. Thank you Seba, we are better for having you wear the blue and gold. Indeed. Amazing that Ernie Stewart arrived, talked about “The Philly Tough Player” and sold the best example thereof. at our best and Le Toux’s best, it was beautiful. Amen, amen. A great article about a great guy, Dan. Le Toux is everything this team is supposed to be. Never should have been sent away. Should still be on the team. Thanks for this piece. the excitement of driving over the Comodore Barry Bridge to our awaiting seats even more. But LeToux and Califf, I miss them the most. They should have finished out their careers playing with the Union and, if desired, stayed on as staff to mold the new players as they came in. A Philadelphia Union post has not appeared in my news feed in ages, but I’m so glad that your post did. Thank you for writing about The Truth. The absolute truth. The Man. The Myth. The Legend. Seba. I liked how when Le Toux took corner kicks, he would raise his hands in the air for Philly fans to get on their feet. They usually did. Thanks for making me cry again. Good old days of the Union when players where their heart on the badge. Great article and the Union haven’t been the same since the last US Open cup loss. After that loss something left the team. Ray has a good heart but he gets lost in the shuffle and Bedoya is getting there. Fabinho also does a lot for the team and Blake is the heart of the team now. The others just don’t feel the same passion. I wonder what former players will make it out East to see this great honour for Leroy’s. Would love to see Danny get that honor as well. Hopefully the originals will and the team will do enough to produce a W for a great legend of Union soccer. Thanks Dan, I witnessed Sega jump into the stands and chat with a woman in a wheelchair who wanted his autograph. He spent several minutes with her before taking a picture, signing her jersey,jumping back down to field level and picked back up signing everything handed to him. The fans parted like the Red sea to allow him to do this. I really miss his class! Thanks Seba! When all is said and done there should be a statue of him outside the stadium. Even met him on the street in center City while he was carrying a vacuum cleaner. Stopped, put the dyson down and took a pic with me and wished me well. I wish him the same. Class act. Great stuff Dan. I miss the early team so much. A long time ago, I wrote on this board that, if he had been asked, Seba would have parked cars for this franchise. I truly believe that he was the type of individual that, had there been a few more of his type around, there would have been no limit to what the team could have accomplished. He was an example that I used for my kids when they were still playing, as non stop movement on the field, and even when his first touch was frustrating to watch, it was not a question of laziness, but of trying to do too much before the ball was controlled. I enjoyed watching him, and wish him the best in everything. Great article Dan! Made me realize how disappointing this team now is. I hope one day we can recapture what this team once was. Seba is a class guy and we look forward to cheering him on June 23rd. Good luck Seba! !